Today is a big day! and it has finally arrived! Wondering what I am talking about? Well, today marks the closing of the first year of my blog! January 2012 I had decided to start a blog, and on the 23rd I posted my first entry, and my first card. I recall I was quite excited about this card, as it was one of the first cards that I had designed, and thought it was pretty cool (worthy of blogging). I wish I had saved it properly, my daughter chewed it up (I am serious!). My husband gave it to her to play with (?!!!) and I found it in the morning in her crib, I was like…is that my card?? I have come a long way since then, from becoming a better designer (hopefully), winning a few challenges here and there, guest designing, and most importantly, joining the design team of my favorite challenge blog!! and so here I am celebrating with some fun prizes. I have seen a lot of bloggers celebrate their blog anniversaries with a random draw for the prize. I considered it and felt that by itself, it was not enough as I really wanted to show appreciation to those who supported me and made me want to design more cards. Therefore I decided to give an appreciation gift to the top three people who made the most comments on my blog! Are you ready for me to reveal them?!! Here they are…. Wida Miller!! — Fun energetic Wida! Back when I was blogging to myself (for about the first 5 months!) Wida made me realize that there was a world of awesome bloggers out there and I should be interacting with them! Thank you Wida for all your support and thoughtful comments! 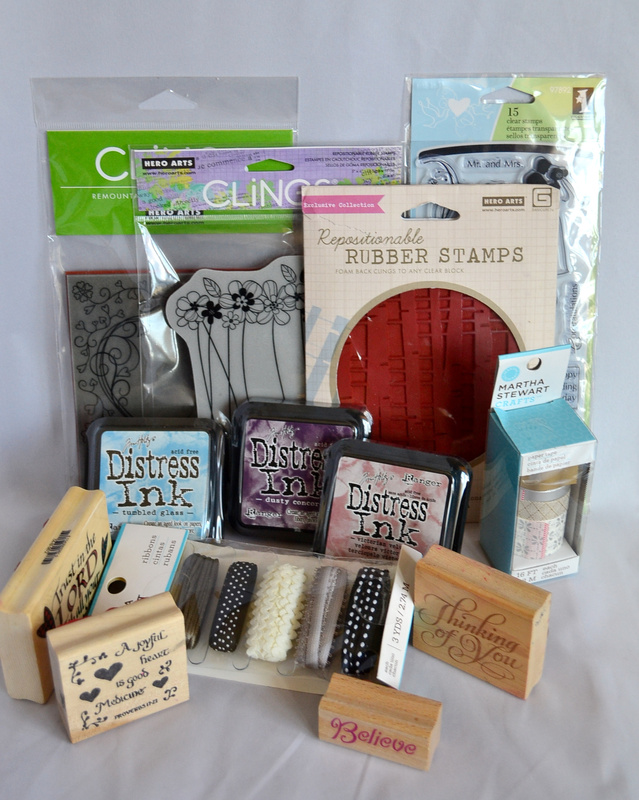 I have included some stamps from one of my favorite stamping companies — Hero Arts, and some inks from my favorite inks–Distress ink, among other things. 2. If you are a follower, you may leave a second comment saying “I am a follower”. If you are not a follower, you can start following now (that is if you wish) by clicking the “Follow” button which you will find on the left side of the top bar or subscribing by email, then leave a comment saying “I am a new follower”. You have until midnight EST on Friday February first to leave a comment. 🙂 I will announce the winner the following Monday. Thanks for visiting! and If you have any questions please leave a note in my “Contact” page. OMG !!!!! i can’t believe this ! this is the first time in my life my name is mentioned by any crafter on her blog and i still coudn;t believe it 😀 and above all m getting something ….this is also happening first time 😀 oh my my ! m sooo xcited ! i’d love to be entered to win the great prizes! thanks a bunch for a chance to win! Congratulations Tasmin on your 1st. anniversary. Hi Tasmin – here is my second comment – I am a follower of your blog and just love your card designs . They are so elegant.. thank you for taking the time to share your talents . Oh what a fun way to celebrate! A very happy anniversary to you, Tasnim! Love your idea to pick the top three cheerleaders. I’ll answer my favorite thing about card-making … of course this amazing community we belong to, but also because it takes me less time than my first paper-craft hobby, scrapbooking. I tend to take a long time on my projects (although I’m getting better) so card-making fits me better. I do get sad sometimes however when I think about all the empty scrapbooks I have. I’d love to add a few this year. Also, very happy to follow your blog, and see your highly creative projects! Congratulations on your first year of blogging!! You are so sweet to send me a prize, YAY! Thanks so much, but I think you are a super talented designer. I love your clean & simple approach and I truly look forward to seeing your unique ideas. I image your second year of blogging will surpass the first one in a major way!! All the best, Tasnim! Congratulations on your anniversary; you have real reasons to celebrate. I retired after 38 years of teaching elementary school, and fell into cardmaking as a way to keep the creative juices flowing. My friends say I needed to be around bright paper, scissors (I can use sharp ones now! ), glue, etc, but I also enjoy the friends I craft with, and the people I meet online that I would never have the chance to meet in my small community. My friends and I donate gift baskets of cards and other goodies to our many community fundraisers, and I send cards to reach out groups across the country. Cardmakers are such a generous and talented group! Thanks for the opportunity to win a prize. Hi Tasnim,just became a blog follower by email…always see your name at other comments when I leave a comment too..so thought to go and have a look what you make…WELL LOVE your cards had a quick look around and will have a better look trough it all the next few days! Congrats on your 1st year as a blogger! Making cards just makes me happy..making them and sending them to let people know I think of them. Also so great to buy all those super /gorgeous/ sweet/elegant /vintage and great itmes..just LOVE all about it! A while back, I discovered your blog on your niece, Nur’s, site, yet couldn’t find the correct link and gave up. I’m so glad that, a few days ago, I decided to try and find it again! Your ideas are really innovative, fresh, and creative! Will definitely try out that fun Birthday card you put up. Oh – happy blog-a-versary! HEY! look I am in your post today! Thanks for the mention. I remember being a guest designer for RIC with you, I think that is how we “met”. Your style is so fresh, really contemporary and I enjoy how innovative you are, so I had to comment…again and again to show you how lovely your work is. I am glad we met and I am glad to see how much you have accomplished in your first year. Here is to another great year! I’m a follower. I found your blog via Runaway challenge quite awhile ago now. Your blog is one of the ones I like to go to first as I always love your colours, design and creations. Happy first year anniversary. I have not plucked up enough courage to start blogging yet but one day I may. Thankfully yours will be around for wonderful inspiration for so long to come! First of all can I just say how awesome and sweet that is that you sent gifts to your Top 3 commenters – that is so refreshing to see! Second of all, congrats on your blog anniversary, Third of all, you are awesome and so is your work! Hi Tasnim, I am a new follower, congratulations on all your success, you are surely an amazingly talented designer!! When I am making cards, I am in my own little world and love how it makes me feel calm and magically my problems all go away. Card making has also allowed me to make friendships from talented crafters from around the world and that is something to be treasured!! I am a follower leaving my second comment. I thought you might enjoy knowing I have saved 4 or 5 of your cards in my idea file. It was fun to adapt your flower in a jar card to go with my mason jar stamp. Your ideas are really fun! Congrats! It is always shocking for me to think that someone as talented and well-established as yourself has only been blogging for a year! My favorite feature on your blog? Your Runway Inspired Challenge posts! And no, I’m not just saying that because it’s my challenge, but it’s because you inspire me each and every time. The way you take an inspiration image and translate it to a card is never short of brilliant! You are awesome! My greatest accomplishment may very well be the wonderful friendships I’ve made through this shared hobby. I never cease to be amazed by the endless kind encouragement and support that can be found – especially considering how negative a place the internet CAN be. I love seeing the way you interpret the challenges, especially Runway Inspired. Wow. You have such a skill for honing in on a beautiful element of the design and making it your own. Best of all, you are kind enough to share your thought process with us. Your warmth and generous spirit shine through in every project. You may have guessed by now that I’m a follower and that I look forward to your posts every day. Thanks for sharing your talents with us and congratulations on your anniversary! (second comment, as a blog subscriber!) As a retired elem school teacher, who started stamping shortly after retirement. I think my best accomplishment with stamping is to be able to share my love of this hobby with many stamping friends AND my 3 year old granddaughter! Here is my second comment: I love the creativity of card making, I love sending my cards to people and make them happy. Many of my friends really treasure my cards and keep them. I also love making cards wih my kids and sometimes with my sister and friends – its shared joy! Happy Blogversary! Your work is wonderful and inspiring. Cardmaking, for me, is my creative outlet. It’s like creating little works of art, or that’s my intention anyway 🙂 Aside from being amazed by your work, I love your tutorials. Thank you for sharing your work and your techniques. Congrats!! I love being creative… it’s calming. Happy “blogaversary”… I discovered you a while back and always loved seeing what you came up with. your designs are very stunning and I have bookmarked many of your cards for inspiration. My fav. thing about card making is the fact that I know it will bring a smile to the recipient’s face …really how many times do we get happy mail via snail mail? Thanks for the chance to win. Oh mannn that card is beautiful. The distressing is perfect 😀 Yay for your first blog-versary with many many more years to come! I am waiting for a few more paycheques before getting those distress inks. But in the meantime, I look forward to more fun distressing from you! Congratulations on your first year of blogging. I currently don’t have a blog, but my 2013 resolution is to set one up. Looking at blogs like yours gives my such great inspiration. Thanks for sharing. What do I like best about your blog? I don’t know how if this is the right word: style. I really enjoy your style of cardmaking. 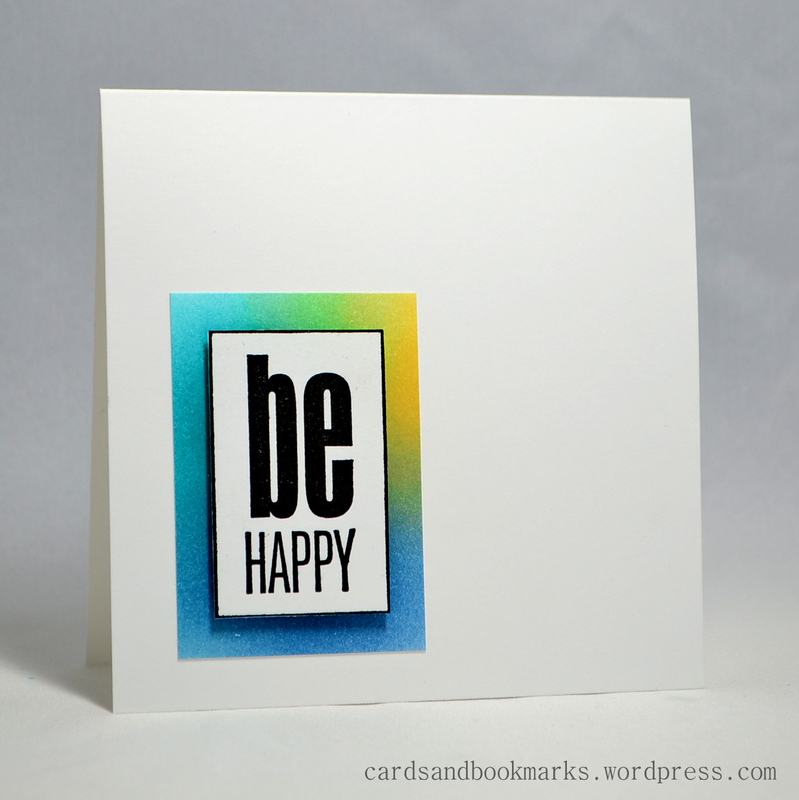 It is really cool the way you use distress inks on your clean and simple cards because I love distress inks. It is refreshing to see them used in a totally different way than I am used to. I am new follower even though I discovered your blog two months ago and have been stalking it quietly. I am glad I found your blog via Runway Inspired. One day I will do challenge. It is hard to believe you have been blogging only a year because you are so talented.